The 7,600 square foot Benihana restaurant features a sushi bar, cocktail lounge, outdoor patio and dining area. 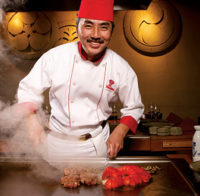 Guests looking for the Benihana experience can dine at one of 18 teppanyaki tables. The restaurant’s sushi bar offers a more casual atmosphere where guests can watch sushi chefs at one of four sushi bar tables. Those who want to keep an eye on the bustling Las Vegas Strip can enjoy fresh sushi options or a colorful cocktail on the patio, which includes 12 tables, or at the bar, which is open to the Strip. Larger groups are easily accommodated, with two teppanyaki tables seating parties of 12 and a sushi-area community table fitting a group of 10. Perfect for special events or parties, the restaurant can also seat guests in two semi-private dining rooms, where they can enjoy the teppanyaki show in their own space.